For anyone who thought fishing was not a dangerous sport, check this out. 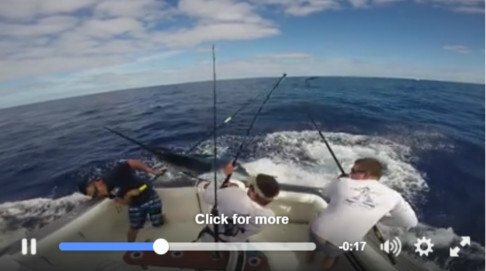 Off the coast of Australia, a swordfish leaped out of the water and nearly harpooned a fisherman in the boat. The scene was captured on video and posted to Facebook recently by fisherman Conor Cogan. The crew was 40 km outside of Fort Stephens near Sydney when the marlin turned the hunters into the hunted. Cogan is the one on the left holding a harpoon when the the 90 kg fish comes thrashing and flipping toward the stern. He quickly ducks as the fish spear nearly misses his head. It was a close call for sure, as swordfish have been known to kill people. Last year, a spear fisherman was impaled by a swordfish in Hawaii and later died of his injuries. But in the story from Australia, the men came away unharmed. The fish did smack Cogan with its tail, but nothing to be too worried about. The maneuver did pay off though, as it appears the fish broke loose of the hook. Had a great day off Port Stephens yesterday on board ” The Pump”. Went 6-6-4 for the day and also had one come into the boat. Pretty much as close as it gets.